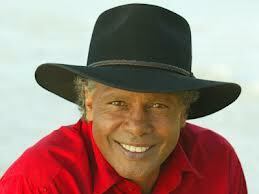 Ernest Ashley Dingo (Ernie Dingo) was born on 31st July 1956 at Bullardoo Station, Yamatji, WA. Ernie Dingo has many talents, such as an actor; television host, reporter and comedian who have made him one of Australia's best known and most loved performers. Ernie grew up in Mullewa, in the Geraldton region of Western Australia. He moved to Perth when he was 17 and his first job was as an apprentice sign writer, which he says developed from his interest in painting. Ernie is the second child of a family of nine. Ernie attended Prospect Primary, then to Geraldton High School. Ernie has had two marriages, the first marriage was to Sally Butler, and they adopted a baby girl, Wilara. The authorities told them that Wilara’s birth mother had a one-night stand with an Indigenous man in a Sydney pub. Ernie was shocked to find out that Wilara’s birth father was Award-winning TV Indigenous actor David Ngoombujarra, which was a relative of a distance Ernie. David passed away last year in July 2011. Ernie has another two children, Zoe and Alyssa. Ernie is also the stepfather of Jurra.